Comics In 5 Panels: Teen-Hero Month: Young Justice. You ever read a Teen Titans comic from the Silver Age? Where Robin and the other sidekicks had really silly adventures, fighting ridicules bad guys like Mr Twister, Ding Dong Daddy and Mad Mod? Young Justice is the 90's answer to that. 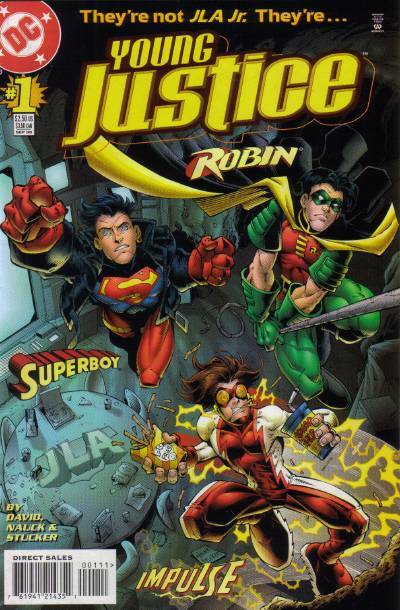 Superboy, Impulse and Robin. They were the teenage superheroes with solo series during the 90's. So with three popular young heroes like that, it was no wonder that DC decided to make them a team. Peter David was the one who became responsible for making the magic work. And he did a wonderful job with what would be the Teen Titans of that decade. This series is fun. The comic is not filled to the brim with angst, grimness and unnecessary gory deaths. It's funny, silly, has strong characters who you actually believe are 14 years old. Not to mention that we have some pretty great revivals of characters who hadn't been used for some time back then, like Red Tornado, who had taken a break from... well, everything, and was meditating in the JLA's old headquarter whatever he was human or just machine. But after Robin and the others move into the cave, he finally get's out of his coma-like state, now realizing that he HAD to be human. How else could these teen-heroes annoy him so much? And that's the most important part of the characters in Young Justice; they ARE annoying, like kids are at that age. Impulse live up to his name, never thinks twice before he does something that seemed like a good idea in his head, and Superboy keeps bragging about his powers(just to name a few). But it's not always silly adventures, like playing baseball in order to save an alien planet, or were-wolfs attacking a TV-show because they feel insulted by how their spices was portrayed. We have heavy stuff, like racism, loosing the right to your child, mother issues and the big D; Death. Death is a resurrecting theme in this series. Like: what does it mean to die? How should we react to murder? Why do people have to die? And since the main characters are just big kids, they can't cope with death as well as adults. My favorite character(besides Red Tornado, but he is an adult) is, believe it or not; Lobo. That's right, Lobo was once part of a teenage super-team. Due to a story-line called "Sins Of Youth," all the adults of the DCU was turned into kids by magic. After the spell was reversed, the only one who did not return to his actual age was Lobo, who for a time had to change title from the Main Man to the Top Teen. and having him be part of Young Justice is probably one of the weirdest thing to ever happen on the pages of a DC series. In fact, my favorite issue through the series is 32, where Lobo actually does all he can to be the perfect gentleman, when he invites one of his teammates out on a date, and even get's hypnotized in order to control himself. Believe me, it's hilarious! So even though the references are outdated, I would say that Young Justice is worth a read. It's not collected in TPB, so you either have to go and buy the issues separately, or find it on Comixology.